Dr. PK is from nearby Naperville, Illinois where he grew up and attended Naperville North High School. He then attended Drake University in Des Moines, Iowa, graduating with a Bachelor’s degree in Biochemistry, Cell and Molecular Biology. Dr. PK always knew he had a strong interest in the human body and passion for helping others. As he pursued a career in physical therapy, he worked as a physiotherapy assistant at a multidisciplinary chiropractic clinic to gain some hands-on experience before applying to school. In that time, he was introduced to and taken back by how chiropractic consistently got patients feeling and functioning better. Dr. PK also admired the conservative, holistic, and hands-on approach to treating patients in the chiropractic setting. These principles led Dr. PK to alter his path, and attend Palmer College of Chiropractic in Davenport, IA. Dr. PK graduated from Palmer College with his Doctorate in Chiropractic. During his time at Palmer, he especially recognizes his humbling experience to Manaus, Brazil. There, he was able to treat hundreds of under-privileged people of the Amazon. 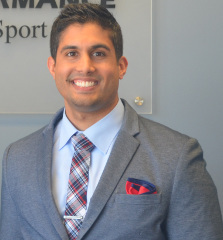 Dr. PK has experience working with an array of patients from newborns, to school teachers, to Crossfit athletes. Understanding that every patient is unique, he utilizes a multitude of techniques so he can provide quality, adaptive, and personalized care. Gonstead, Diversified, Activator, Cox Flexion-Distraction, as well as special training in extremity adjusting are all highly recognized techniques he uses in the office. Dr. PK also has a special background in diagnosing and treating a wide variety of soft tissue conditions with manual adhesion release, by utilizing the Integrative Diagnosis protocol. Dr. PK enjoys staying active by working out at Olaf Crossfit in Batavia. He also enjoys cheering on his beloved Chicago sports teams, and spending time with his loved ones. Enough about me! How can we be of service to you and help you with your specific health challenge? Contact Performance Spine & Sport today to make an appointment.